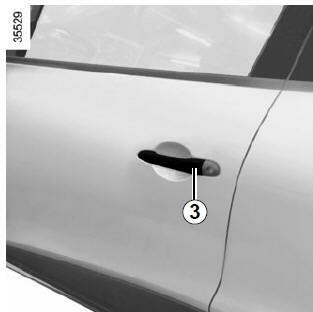 If the vehicle is equipped with a deadlocking function, this allows you to lock the opening elements and to prevent the doors from being unlocked using the interior handles (for example, by breaking the window and then trying to open the door from the inside). Never use deadlocking if someone is still inside the vehicle. Press button 2 twice in quick succession. With the vehicle unlocked, you can also press the button 3 on the driver’s or passenger’s side door twice in quick succession. 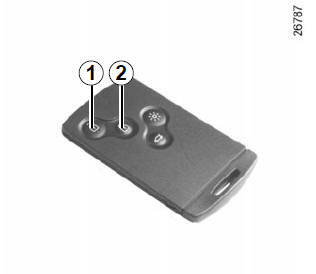 In both cases, locking is indicated by the hazard warning lights flashing five times. Unlock the vehicle using button 1 on the RENAULT card. The hazard warning lights flash once to indicate that the doors have been unlocked. After activating the deadlocking function using button 2, “handsfree” locking and unlocking are deactivated.